As part of the launch of Windows 10, I was given the chance to design one of the initial apps for the new platform. One of the main focuses of Windows 10 is their Universal Windows Platform (UWP) app whose design is scalable to look great on all Windows 10-based devices, from phones to tablets and PCs up to Surface Hub and television experiences. 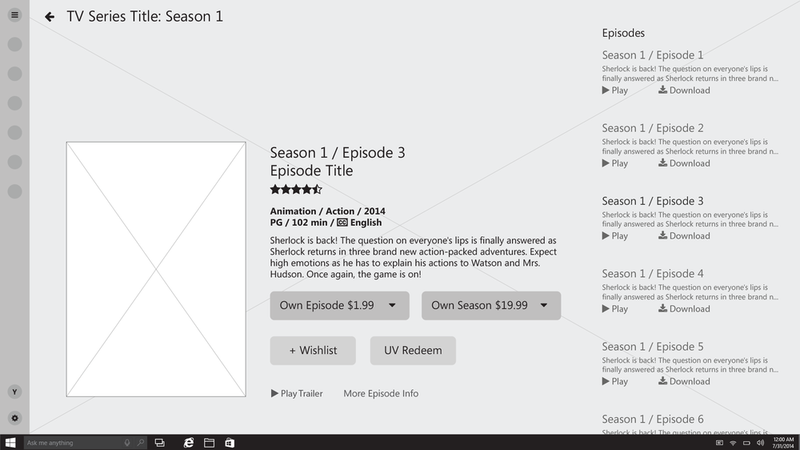 It was my job to design a Windows 10UWP app for VUDU’s digital video service. The goal was to update and showcase VUDU’s current app design, but also showcase the app as a part of the Windows 10 family of apps. 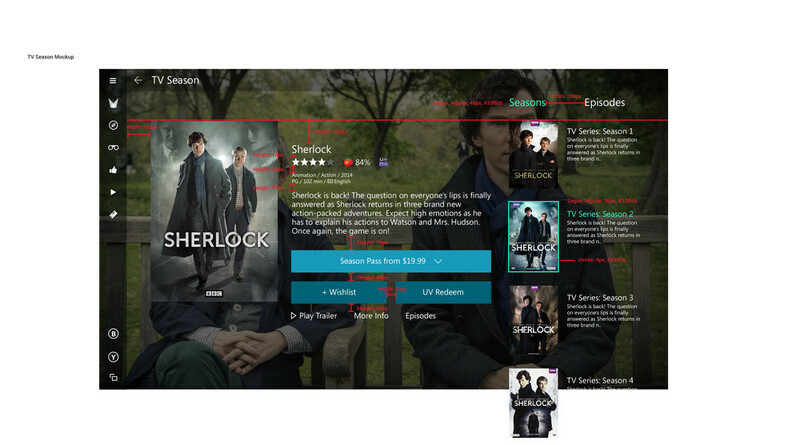 Though the app would be designed to scale across all devices, the main initial focus was the design of the Xbox One view. 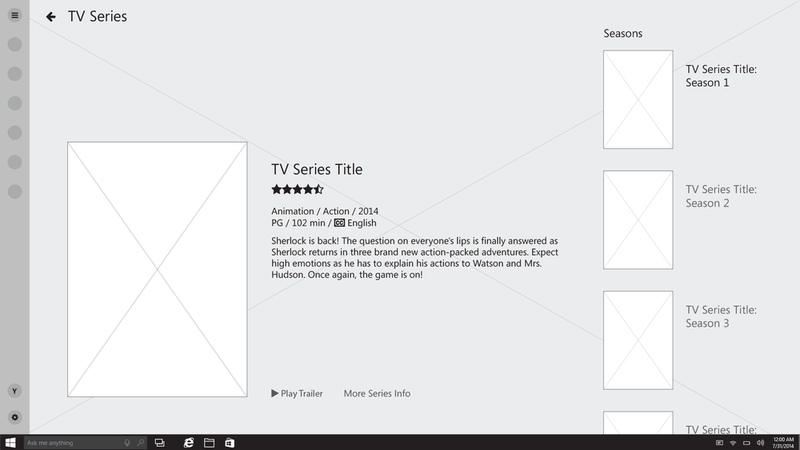 An in-depth design for a Universal Windows Platform app that featured VUDU’s vast and very high quality content to their customers who use Windows 10-based devices. Following the Universal Windows Platform app approach, I created one app that is intended to scale across devices, large and small, while still maintaining a consistent experience for the customers. 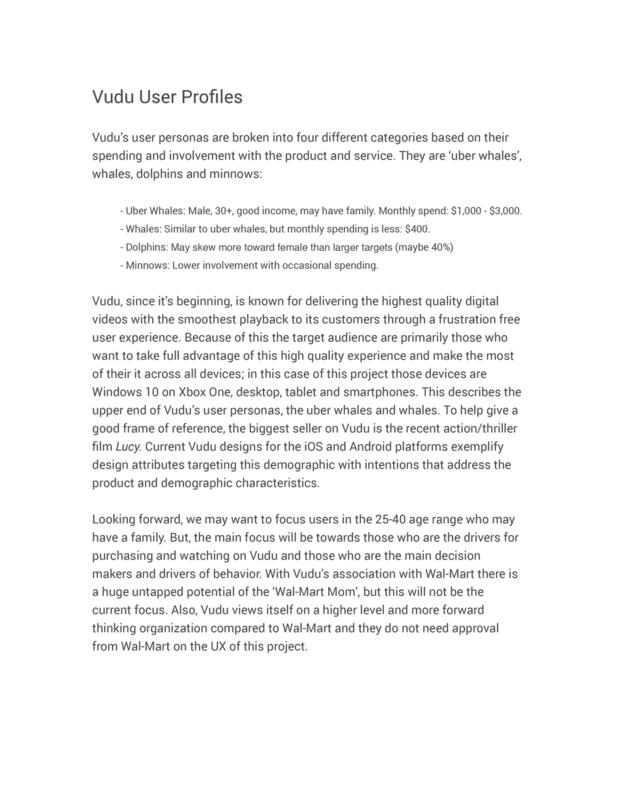 I had the opportunity to travel to VUDU’s headquarters in California to speak and work with them directly in the initial stages of the project. From our initial discussions I was able to gather information that allowed me get a better grasp of both the details of the project and the larger scope within which it lives. From these discussions I was able to put together user profiles that helped direct the design moving forward. I conducted competitive research and explored beyond competitors to see other examples of other solutions to interacting with and displaying video content catalogs on a television with a Xbox controller in your hands. 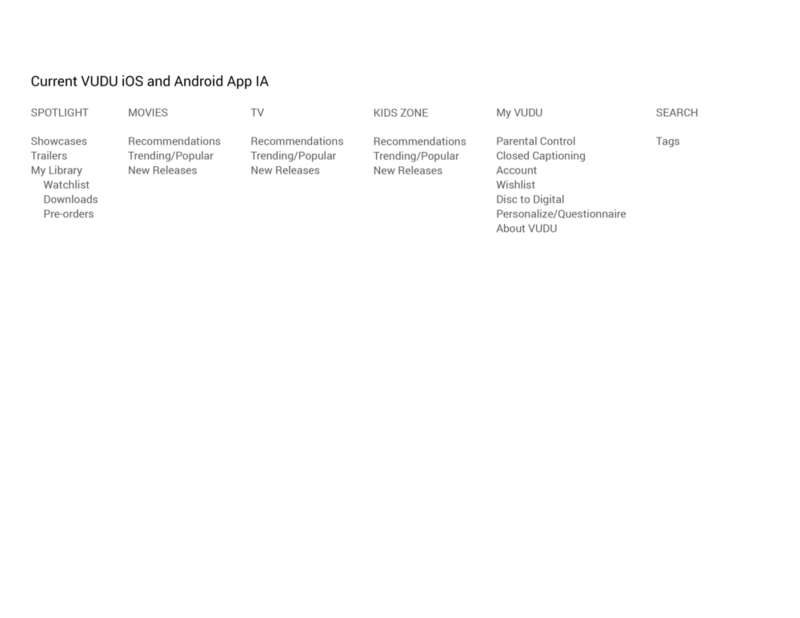 Through a card sorting exercise I explored ideas to improve the information architecture of VUDU’s current iOS and Android apps to create a more natural and intuitive structure in the Windows 10 version. 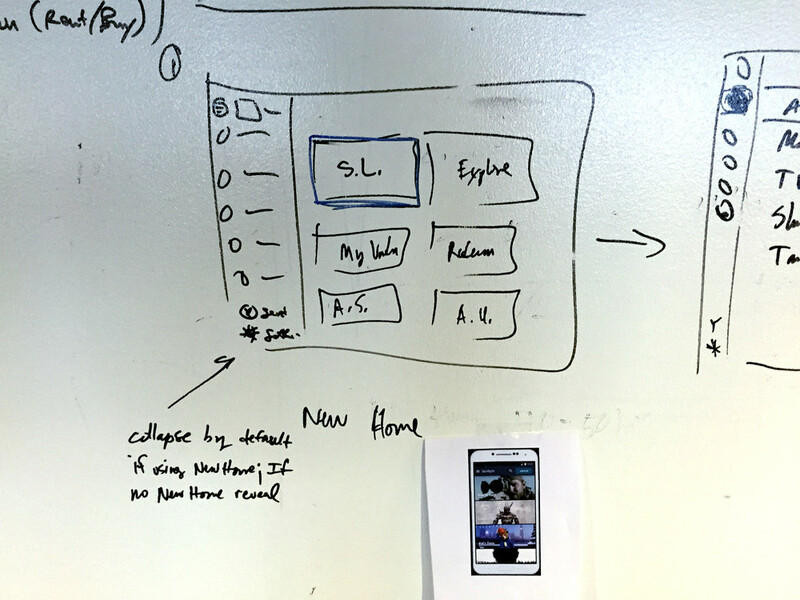 Using the current Android app as base for the information architecture of the app, I began sketching ideas of some of the keys screens. Then I began to explore how the design for the Xbox One experience could scale down through the different devices, while keeping in mind the different interaction affordances with each device. 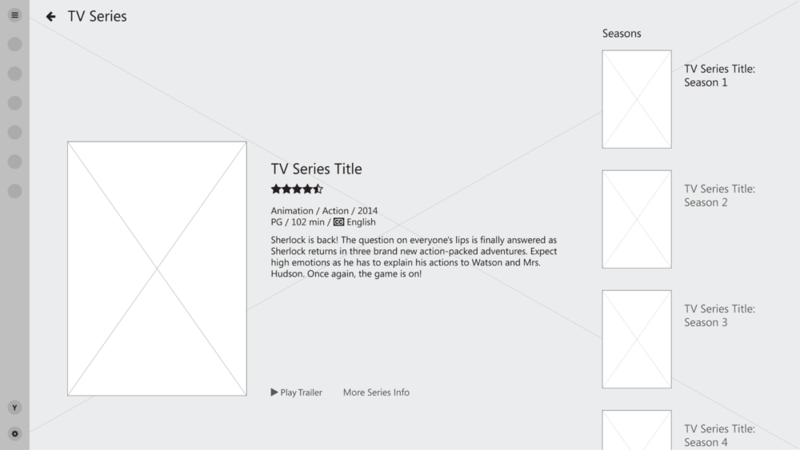 I initially focused on the movie/show detail screen design, because this screen had to display the vast amount of details about each item in VUDU’s catalog. The next step was to build out the flow of the more in-depth experience in wireframes and designing the interactions between screens. With the Xbox One view being the primary focus, the rest of the project focused on polishing those designs and the scaling to other devices would be based off of wireframes. As the app design was filled out more and more the visual designs also began becoming more and more refined. The final hand off to the developers included high-res comps with assets along with redlines for them to follow.